Florence Jean Danielson, age 87, of East Grand Forks, MN, passed away on Monday, April 1, 2019, at Touchmark Assisted Living Facility in Fargo, ND. Florence Grove was born on April 19, 1931, on the family farm in Reynolds, ND, the daughter of Bennie and Minnie (Wilson) Grove. She was raised in Reynolds, ND, and graduated from Central High School in Grand Forks, ND. Florence graduated from the University of North Dakota with a Bachelor’s Degree in Business Education and got her first teaching job in Greenbush, MN. On December 19, 1954, she married Donald Danielson at Rosendahl Lutheran Church in Reynolds, ND. While Donald was deployed with the US Navy, she completed her year of teaching in Greenbush and then joined him in Norfolk, VA, where he was stationed. Before setting up residence in East Grand Forks, they lived in various cities in Minnesota: Hendricks, Minneapolis, and Breckenridge. In 1959, they moved to East Grand Forks, MN, living there for 57 years and raised their family. During that time Florence was a homemaker and worked for the East Grand Forks schools and at Popplers Music Store. 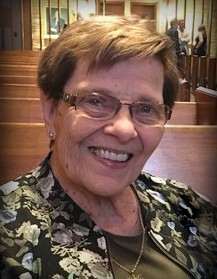 She was a very active member and volunteer at Our Savior’s Lutheran Church. Florence loved to host people at her house, including Bridge Club and after concert dessert nights. She was a dedicated wife, mother, and grandmother and loved attending various activities, concerts, and sporting events in which her children and grandchildren participated. She enjoyed sewing, quilting, gardening, and passing down her lefse making skills. Florence and Don enjoyed traveling during retirement and went to Norway, Ireland, and traveled extensively in the United States. She will be forever loved and greatly missed. Florence is survived by her daughters, Karen (Cliff) Bimberg of Detroit Lakes, MN, and Gayle (Chuck) Driscoll of West Fargo, ND; son, Paul (Cheryl) Danielson of Eagan, MN; 7 grandchildren, Jeremy (Paula) Bimberg, Jodie (Jeff) Schreier, Adam (Quinn) Driscoll, Anna (Nick) Mitchell, Eric (Adrienne) Driscoll, Megan Danielson, and Scott Danielson; 3 great-grandchildren, Graham and Rex Driscoll, Gabriel Mitchell, and one great-grandchild expected in July; as well as many nieces, nephews, cousins, and friends. She was preceded in death by her husband Donald Danielson; parents, Bennie and Minnie Grove; brothers, Art, Burnett, and Clayton Grove; and sister, Vi Torkelson. Funeral Service: 11:00 am on Monday, April 8, 2019, at Our Savior’s Lutheran Church in East Grand Forks, MN, with visitation one hour prior to the service. Visitation: 3:00 pm to 5:00 pm followed by a Prayer Service at 5:00 pm on Sunday, April 7, 2019, at Dahl Funeral Home in East Grand Forks, MN.